Beautiful and inspiring book about the angels, full of stories from the Saints. 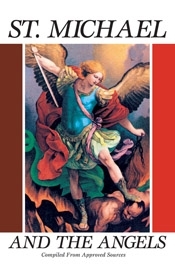 Discusses St. Michael in detail; give their nature and role, the need for devotion to them and their relationship to the Blessed Virgin Mary. Many prayers to the angels. Crucial in our time. It is the time to invoke Michael and our own guardians!